BACKGROUND AND PURPOSE: Intravascular stents are being used with increasing frequency in interventional neuroradiology. They provide the potential to expand the therapeutic capabilities of the endovascular therapist and stand to revolutionize endovascular intervention within both the intracranial and extracranial vessels. We present our application of stent technology to further the understanding of endovascular rescue from procedural complications and the solving of complex clinical problems. METHODS: Three patients underwent unplanned placement of intravascular stents. In two patients a stent was used to provide stabilization of an irretrievable intravascular device; in the third patient a stent was used to provide a scaffolding for proximal external carotid sacrifice. RESULTS: Stent deployment was successful in all patients. The intravascular devices stabilized by stent placement included unraveled fragments of a Guglielmi detachable coil (GDC) and a partially deployed coronary stent. Proximal external carotid sacrifice was achieved with the aid of a stent in one patient to control hemorrhage from recurrence of laryngeal cancer. No periprocedural neurologic complications were encountered. Six-month follow-up angiography in one patient showed only minimal myointimal hyperplasia induced by stent-stabilized GDC fragments adjacent to the internal carotid vessel wall. CONCLUSION: Stents can be used to provide stabilization of irretrievable intravascular devices or as a scaffolding for proximal vessel sacrifice. 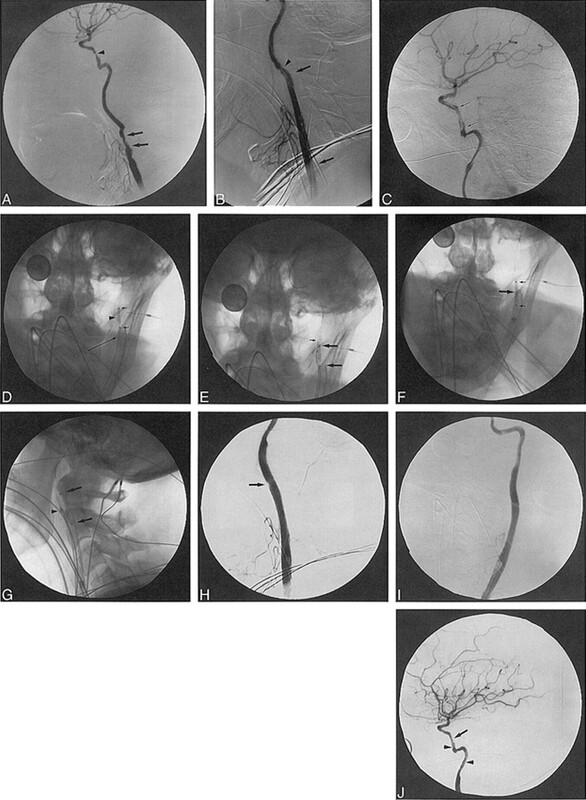 These applications may allow endovascular rescue of procedural complications and solve unique clinical problems. Intravascular stents provide the potential to expand the therapeutic capabilities of the neuroendovascular therapist. Stent technology is advancing at a rapid pace, with many flexible stent delivery systems now capable of reaching the intracranial circulation. Undoubtedly this technology will have a profound effect on neuroendovascular practice. We report our use of stents to assist in the management of three complex clinical problems. Clinical and angiographic records were reviewed in three patients in whom unplanned intravascular stent placement was used to stabilize irretrievable intravascular devices against the vessel wall or to provide a scaffolding for proximal external carotid sacrifice. A 63-year-old woman with chronic headaches was transferred to our institution approximately 24 hours after having been found lethargic at home. A CT study revealed diffuse subarachnoid hemorrhage with focal clot in the left carotid cistern and low density in the left temporal lobe. Arteriography performed at an outside institution showed two left posterior carotid wall aneurysms. Clinically, the patient was somnolent, had global aphasia, right hemiparesis, and a fixed left pupil; her Hunt and Hess grade was 4. Repeat angiography was requested to characterize further the aneurysms with regard to their potential for embolization with Guglielmi detachable coils (GDCs; Target Therapeutics, Fremont, CA). After the induction of general endotracheal anesthesia, the Seldinger technique was used to gain access to the right common femoral artery via a 6F sheath. 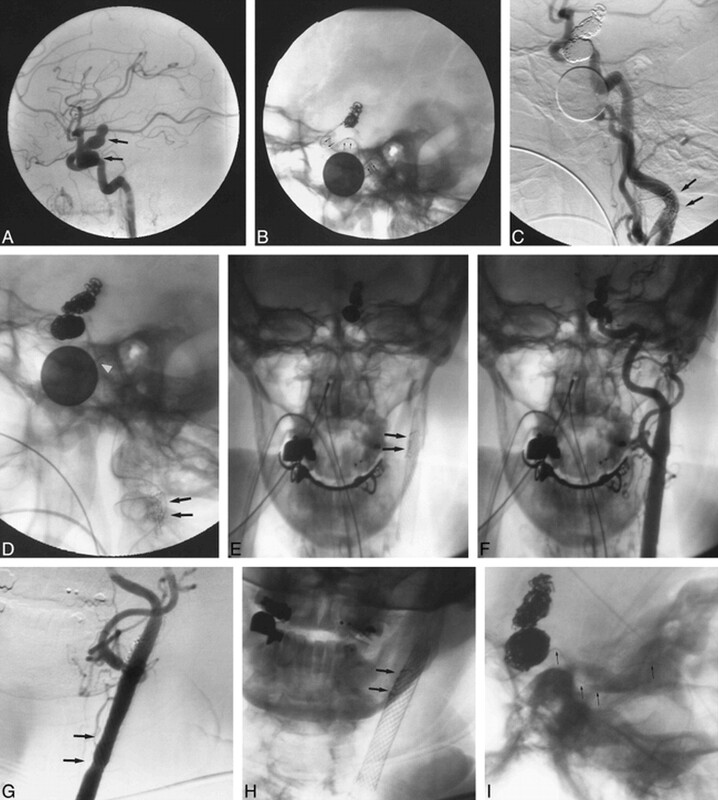 Angiography showed two left posterior carotid wall aneurysms, the more superior of which had most likely ruptured from an apical protuberance (Fig 1A). Both aneurysms appeared to have favorable necks for endovascular therapy. Systemic anticoagulation was administered with a bolus of 5000 U heparin, followed by a heparin infusion to maintain an activated clotting time (ACT) between 200 and 250 seconds. 63-year-old woman (with a Hunt and Hess grade of 4) who had subarachnoid hemorrhage from ruptured aneurysms of the left posterior carotid wall. A, Lateral view from left ICA angiogram shows two large posterior carotid wall aneurysms (arrows), one of which is bilobate. B, Lateral fluoroscopic image shows multiple GDCs within the superior aneurysm as well as a long, linear strand of coil (arrows) extending proximally into the cavernous and petrous portions of the ICA. A RapidTransit microcatheter is within the aneurysm and a dime (18 mm) is present for measuring purposes. C, Lateral view from a left CCA angiogram through the guiding catheter shows near occlusion of the two aneurysms by a GDC, a linear strand of coil within the cavernous and petrous segments of the ICA, as well as a tangled mesh of unraveled coil (arrows) more proximally within the cervical segment. D, Lateral fluoroscopic image from the angiogram in C better shows the coil mass in the cervical ICA (arrows) as well as the coil fragment (arrowhead) connecting this mass to the coils within the posterior carotid wall aneurysm. The RapidTransit microcatheter and dime are again visible. E, Anteroposterior fluoroscopic image of the carotid bifurcation shows a Wallstent endoprosthesis pinning the migrated coil fragments (arrows) against the wall of the proximal cervical segment of the ICA. F, Anteroposterior left CCA angiogram shows patency of the ICA and ECA in the region of the Wallstent. The stent crosses the bifurcation. G, Six-month follow-up anteroposterior CCA angiogram shows mild intimal hyperplasia within the stent (arrows), without significant stenosis. There is continued patency of the ICA and ECA at the level of the stent. H, Anteroposterior fluoroscopic image from the angiogram in G shows the coil mass (arrows) pinned to the wall of the ICA with the Wallstent. I, Lateral fluoroscopic image shows multiple GDCs within the two aneurysms and a small linear coil fragment (arrows) extending from the aneurysms inferiorly into the cavernous and petrous segments of the ICA. A 6F Envoy introducing catheter (Cordis Endovascular, Miami Lakes, FL) was positioned in the cervical left internal carotid artery (ICA). A 3F RapidTransit (Cordis) microcatheter and a 0.016-inch gold-tipped glidewire (Terumo, Boston, MA) were used to achieve selective catheterization of the more superior aneurysm. The first GDC (5-mm × 12-cm T-18 soft coil) was advanced into the aneurysm and detached without incident. Because the portion of the aneurysm that was filled with coils first was thought to represent the site of rupture, T-10 soft coils were chosen to perform embolization of the remainder of the aneurysm's superior lobe. During positioning of the third coil (a 5-mm × 15-cm T-10 coil), it was noted that a portion of the coil had unraveled and herniated into the ICA as a long linear strand extending proximally into the cavernous and petrous segments (Fig 1B). This strand appeared to be connected to the intact coil within the aneurysm. Attempts to withdraw the unraveled coil only served to move the entire coil mass and risk ICA occlusion. We elected to advance as much coil into the aneurysm as possible and detach it, leaving the linear, small-diameter strand free in the ICA. The catheter was then carefully withdrawn under direct fluoroscopic observation. A second RapidTransit microcatheter was used for recatheterization of the superior aneurysm, and additional T-10 coils were deployed without incident. After catheterization of the inferior aneurysm, multiple T-18 GDCs were detached within this aneurysm to achieve a satisfactory result. During coiling of the inferior aneurysm it became apparent that, in addition to the small linear strand of coil in the cavernous and petrous segments, there was a larger, tangled piece of unraveled coil within the mid-cervical portion of the ICA (Fig 1C and D). Because this remained attached to the linear strand in the petrous and cavernous segments, and hence to a coil within the aneurysm, attempts to retrieve the coil mass risked pulling the other coils out of the superior aneurysm. Owing to concern that the unraveled mass within the ICA represented a significant potential embolic source, we elected to attempt to pin the coil mass against the wall of the ICA with a Wallstent (Schneider/Boston Scientific, Boston, MA). Unfortunately, the Wallstent delivery apparatus could not be advanced beyond the coil mass and, in fact, was progressively pushing the coil mass higher into the upper cervical segment near the skull base. An Endeavor 8501 nondetachable silicone balloon catheter (Target Therapeutics) was advanced beyond the coil mass. By intermittently inflating then withdrawing the balloon, we were able to pull the coil mass more proximally, ultimately wedging it at the carotid bifurcation, partially within the external carotid artery (ECA). An initial attempt to push the coil mass into the ECA was unsuccessful. With the coil near the common carotid bifurcation, we were able to pass the delivery apparatus for a 10 × 68-mm Wallstent across the unraveled coil mass. The stent was deployed, thus preventing distal migration and reducing the risk of emboli generation by pinning the coil mass against the vessel wall (Fig 1E). A common carotid angiogram (Fig 1F) showed continued patency of the ICA and ECA with no evidence of distal emboli. The aneurysms remained nearly completely occluded. Anticoagulation was reversed with protamine, all catheters were withdrawn, and antiplatelet therapy was instituted with aspirin 325 mg twice a day and clopidogrel (Plavix; Sanofi Pharmaceuticals, New York NY) 75 mg four times a day. Clopidogrel was stopped after 1 month. The patient made a good initial recovery, returning home with some persistent mild speech deficit, very mild right-sided weakness, and difficulty with short-term memory resulting from the vasospasm and initial hemorrhage. A follow-up arteriogram 6 months after stent placement and GDC embolization showed nearly complete occlusion of the aneurysms and minor intimal hyperplasia associated with the stent (Fig 1G). No significant stenosis was seen within the stent. The unraveled coil fragment could plainly be seen extending from the aneurysm (Fig 1H) into the cervical ICA, where it remained pinned to the wall of the vessel by the Wallstent (Fig 1I). At 9 months, the patient was independent, with minimal neurologic deficit. A 61-year-old woman with a history of hypertension, diabetes, coronary artery disease, and peripheral vascular disease presented with right-sided facial numbness. 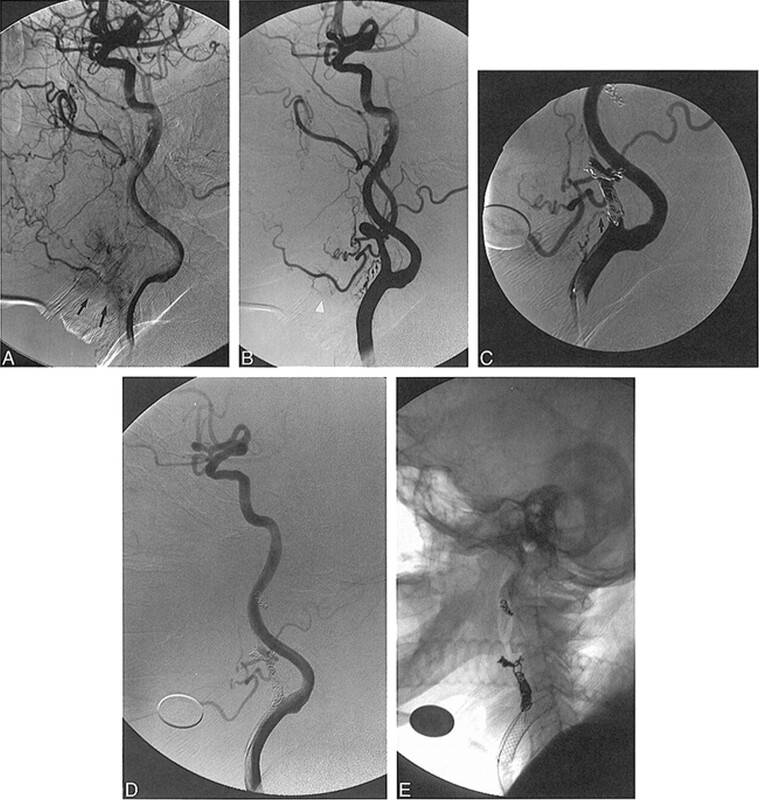 Angiography showed right ICA occlusion with leptomeningeal collateral flow to the right hemisphere via the posterior cerebral artery, no significant anterior or posterior communicating arteries, and tandem stenoses (Fig 2A) of both the cervical and vertical petrous segments of the left ICA. Her transient ischemic symptoms persisted despite both antiplatelet therapy and therapeutic warfarin. Xenon-133 single-photon emission CT (SPECT) blood flow studies confirmed middle cerebral artery division steal and low flow after administration of acetazolamide. She elected to undergo angioplasty and stenting of both lesions. Patient 2. A–C, Angiography: ECA occlusion distal to small superior thyroidal and lingual branches, irregular narrowing in cervical ICA (arrows) and severe stenosis in vertical petrous ICA (A); Wallstent across carotid bifurcation (arrows) with ECA branches patent, improved CCA contour/caliber after deployment, but mild ICA spasm distal to stent (B); inflated AVE stent delivery balloon (arrows) shows reduced petrous ICA stenosis while stent is unattached to uninflated balloon (C). D–G, Fluoroscopy: AVE stent (arrowhead) with delivery balloon (short arrows) withdrawn over ACS guidewire into cervical ICA (D); 2-mm microsnare (small arrow) around ACS guidewire before AVE stent stabilization for balloon catheter (large arrows) removal (18-mm dime for measurement) (E); microsnare around AVE stent (large arrow) beside undeployed Palmaz-Schatz stent mounted on Courier balloon catheter (small arrows) (F); Palmaz-Schatz stent (arrows) deployed in distal ICA with crushed AVE stent (arrowhead) against distal cervical ICA and microsnare attached (G). H–J, Angiography: adequate ICA lumen adjacent to crushed, pinned AVE stent (arrow) after Palmaz stent deployment (H); AP view confirms adequate ICA lumen (I); minimal residual petrous ICA stenosis (arrow) and normal filling of MCA and ACA at procedure's end but irregular distal cervical and petrous ICA (arrowheads) shows residual spasm/dissection (J). Institutional review board approval was obtained for the intracranial use of a coronary stent. Forty-eight hours before the procedure, antiplatelet therapy (clopidogrel, 75 mg/day) was added to the patient's regimen of heparin and 325 mg/day of aspirin. Once the patient was in the angiography suite, an 8F right common femoral sheath was placed. A bolus dose (0.25 mg/kg) of abciximab (ReoPro; Centocor B.V./Eli Lilly, Indianapolis, IN) was given intravenously over 10 minutes followed by a continuous infusion (10 mcg/min) for the next 12 hours. Heparin was also administered to maintain the ACT between 200 and 250 seconds. Preprocedural antibiotics and dexamethasone (10 mg) were administered, and general endotracheal anesthesia was induced. Through the right groin sheath, a Simmons II (Terumo) catheter was advanced into the left common carotid artery (CCA) and arteriography (Fig 2A) was performed. The cervical portion of the left ICA was irregular, with a 54% stenosis. An exchange length wire was advanced across the stenosis, and the Simmons catheter was removed. A 10 × 42-mm Wallstent was advanced across the irregularity. Once the Wallstent was released, the ICA showed excellent contour, with no residual stenosis (Fig 2B). A guiding catheter was advanced over the exchange wire, through the Wallstent, and into the distal cervical ICA. A 0.014-inch High Torque Floppy II 300-cm guidewire (Guidant/ACS, Temecula, CA) was advanced beyond the petrous carotid stenosis and positioned in the supraclinoid ICA. The delivery balloon for a 3 × 12-mm AVE gfx coronary stent (Arterial Vascular Engineering, Santa Rosa, CA) was advanced. Pentothal burst suppression was induced for neuroprotection. Once across the stenosis, the angioplasty balloon with the stent around it was inflated, and apparently full expansion of the stent was observed. When the balloon was deflated and withdrawn, the stent withdrew with it into the proximal petrous segment. An arteriogram revealed that the area had been dilated well, although the stent was not in position (Fig 2C). The Guidant wire was left across the stent. An attempt to withdraw the stent and balloon back into the guiding catheter to remove them only served to lodge the stent on the distal aspect of the Wallstent in the neck (Fig 2D). A 2-mm Amplatz gooseneck microsnare (Microvena Corp, White Bear Lake, MN) was advanced through the guide catheter adjacent to the angioplasty balloon beyond the tip of the ACS guidewire, which was positioned in the petrous ICA. The snare was opened around the distal aspect of the ACS wire then withdrawn back over the wire to ensnare the stent (Fig 2E). This maneuver stabilized the stent to allow removal of the angioplasty balloon, leaving a cervical ICA Wallstent, an ensnared coronary stent stuck to its distal aspect, and a microwire through both. Numerous attempts to remove the stent with the snare were unsuccessful owing to the AVE stent's entanglement on the distal aspect of the Wallstent. The groin sheath was now upsized to 9F, and a 9F guide catheter was advanced into the cervical ICA over the microwire and snare. To remedy the situation, a Palmaz-Schatz articulated stent (Johnson & Johnson Interventional Systems, Warren, NJ) was crimped onto a 7-mm × 2-cm Courier balloon catheter (MediTech/Boston Scientific), advanced from the opposite groin to the cervical segment of the ICA, and inflated. This compressed the AVE stent, with the Microvena snare around it, against the wall of the vessel (Figs 2F-I). The proximal portion of the wire for the snare was left protruding from the right groin sheath. The next day, the wire was cut and secured to the outside of the common femoral vessel wall by a member of the vascular surgery service. Once the endovascular procedures were completed, no remaining stenoses were evident (Fig 2J) and opacification of the intracranial circulation was improved. The patient awoke from general anesthesia without neurologic deficit. A follow-up xenon-133 SPECT study showed improved left hemispheric perfusion. The patient remained asymptomatic during the next few days in the hospital and was discharged on aspirin 325 mg/day and clopidogrel. Follow-up angiography is planned. A 65-year-old man with a history of metastatic laryngeal squamous cell carcinoma and recurrent tumor in the right side of the neck encasing several ECA branches presented with significant oropharyngeal bleeding and hypertension (blood pressure, 200/110). The bleeding decreased with blood pressure control, but owing to CT evidence of tumor proximity to ECA branches, further bleeding was anticipated. Religious beliefs precluded blood transfusion. Endovascular embolization was requested to reduce the risk of recurrent massive hemorrhage. Physical examination revealed slight oozing into the oropharynx. After placement of a right common femoral artery 6F sheath, a 5F Simmons II glidecatheter was advanced into each CCA. Angiography of the right CCA revealed a vascular tumor blush in the right hypopharyngeal area (Fig 3A), with feeding from a small proximal ECA branch very close to the CCA bifurcation (Fig 3B, arrows). Additional supply arose from the proximal facial and lingual arteries (Fig 3B, arrowhead). An exchange-length glidewire was used to exchange the Simmons catheter for a 6F Envoy introducing catheter, which was positioned within the proximal right ECA. Systemic anticoagulation with heparin was then initiated. A RapidTransit microcatheter was advanced into the ECA over a 0.018-inch gold-tipped glidewire (Terumo). The microcatheter was positioned just distal to the origin of the facial artery. Embolization was performed at this site by using 2 × 20-mm Flower coils (Target Therapeutics), with the intention of packing the ECA distally to proximally to occlude the origins of the facial and lingual arteries as well as the small above-described proximal branch. Because relatively proximal coil packing was required to achieve occlusion of these vessels, GDCs were used in the more proximal ECA. Even with GDC-controlled deployment there was concern over possible migration of the coils into the ICA (Fig 3C). For this reason we elected to place a stent across the carotid bifurcation to prevent inadvertent ICA violation. 65-year-old man with recurrent squamous cell carcinoma of the neck surrounding the ECA branches who presented with significant oropharyngeal bleeding. A, Lateral view from late arterial-phase right CCA angiogram shows vascular tumor blush (arrows) corresponding to recurrent neck tumor. B, Lateral view from early arterial phase right CCA angiogram shows tiny branch (arrows) off proximal ECA supplying the tumor. Additional supply originates from the facial and lingual arteries (arrowhead). C, Lateral view from a CCA angiogram shows an Envoy guiding catheter in the CCA, a coaxially placed RapidTransit microcatheter in the proximal ECA, and multiple GDCs within the proximal ECA. More distally positioned Flower coils are also seen in the ECA. There is continued filling of a small proximal tumor feeder (arrow). D, Lateral view from a postembolization CCA angiogram shows near occlusion of the ECA with no further tumor blush or significant filling of the previously noted proximal feeding vessel. E, Lateral fluoroscopic image of the carotid bifurcation shows the Wallstent providing support for GDC sacrifice of the ECA. An exchange-length 0.035-inch glidewire (Terumo) was positioned with its tip in the upper cervical portion of the right ICA. The delivery apparatus for a 10 × 20-mm WallStent was advanced across the carotid bifurcation. After stent deployment, multiple additional GDCs were deposited within the proximal ECA by passing the RapidTransit catheter through the stent interstices. This allowed coil packing of the proximal ECA and occlusion of the small proximal branch contributing to the tumor blush. A postembolization right CCA angiogram (Fig 3D and E) showed near occlusion of the ECA with no further significant tumor blush. After the procedure, the patient was managed with clopidogrel 75 mg four times a day for 1 month and chronic aspirin (325 mg four times a day). No further bleeding has occurred during 3 months of clinical follow-up. Stent deployment successfully stabilized irretrievable intravascular devices in two patients, without obvious periprocedural neurologic complications. In both patients, stabilization by an intravascular stent avoided the need for surgical removal of the devices. In patient 1, unraveled GDC fragments were stabilized against the wall of the ICA by a 10 × 68-mm Wallstent, which crossed the carotid bifurcation. This stent length was chosen to provide as much stent coverage of the GDC fragment as possible. Despite the increased frequency of myointimal hyperplasia with longer stents, follow-up angiography at 6 months showed only minimal non–flow-limiting hyperplasia. Additionally, we saw no migration of the GDC fragments pinned by the stent. In patient 2, a partially deployed coronary stent could not be retrieved owing to its entanglement with a Wallstent in the distal cervical ICA. After using a snare to prevent stent embolization, we stabilized the coronary stent against the wall of the ICA by deploying a balloon-mounted Palmaz stent. The lumen of the ICA was preserved with no significant stenosis at the level of the stent. Follow-up angiography is planned. Stent deployment allowed proximal ECA sacrifice in patient 3 to control hemorrhage from recurrent laryngeal carcinoma. Despite the controlled deployment of GDCs, occlusion of a proximal ECA branch tumor feeder was not possible without risking coil embolization or protrusion into the ICA. The stent provided a barrier to coil movement into the ICA while maintaining an adequate ICA lumen. During 3 months of clinical follow-up, no further hemorrhage occurred. Unraveling and fracturing are estimated to occur in less than 2% of GDCs (1), with forceful manipulation damaging the device and predisposing it to fracture (2). Three circumstances exist in which undue stress may be placed on the coil: 1) When placing the final coils in an attempt to tightly pack an aneurysm, the interventionalist may encounter resistance to coil advancement or withdrawal, and excessive torque can damage the system. 2) When deploying a 0.010-inch (T-10) coil through a 0.018-inch (T-18) microcatheter, the coil may fold in on itself inside the larger catheter, placing undue stress on a portion of the coil and predisposing it to breakage. Although not recommended by Target Therapeutics, T-10 coils are occasionally needed in an aneurysm that has undergone catheterization with a T-18 microcatheter. In this instance, it may be less risky to deploy the T-10 coils than to exchange microcatheters, particularly in ruptured aneurysms. 3) In instances of false coil detachment, coil fracture can occur when withdrawing the introducing wire; in such circumstances, great care is required to prevent coil unraveling and fracture. Passage of a T-10 coil through a T-18 catheter most likely contributed to coil unraveling and fracture in our case. This allowed unrecognized folding of the coil within the catheter, and the resultant undue stress on the coil caused unraveling within the catheter as the coil was passed into the aneurysm. As the unraveled portion of the coil passed out of the catheter into the aneurysm, it herniated into the parent vessel. This was not immediately recognized owing to the small caliber of the fragment, which caused it to be confused with the adjacent microcatheter. Two mechanisms could account for the large, unraveled coil mass in the cervical ICA, which was recognized subsequently. One is that a fragment of unraveled coil may have been retained within the microcatheter, despite detachment of the intact section of coil. This fragment may have been connected either to the detached coil segment within the aneurysm or to the herniated, unraveled segment in the ICA. When the microcatheter was withdrawn more proximally into the ICA and ultimately into the guiding catheter, further unraveling may have occurred, with ultimate fracture. The second mechanism involves the possibility of unrecognized false detachment of the intact portion of the coil, with unraveling and fracture within the microcatheter, during withdrawal of the GDC-introducing wire. Withdrawal of the microcatheter could have led to release of the remainder of the unraveled fragment into the ICA or into the guiding catheter, and ultimately into the ICA. Regardless of the mechanism, the event was not recognized owing to a perception of coil stability involving the fragments in the ICA and in the aneurysm within a highly magnified field of view during fluoroscopic observation of microcatheter withdrawal. When coil unraveling and fracture occur and are appropriately recognized, attempts can be made to retrieve the fragment with an intravascular snare (3, 4) or to withdraw the microcatheter and coil as a unit using the dual guidewire technique described by Standard et al (2). Snare retrieval is technically difficult and risks intimal injury or distal embolization. The dual guidewire technique is elegant, but requires recognition of the situation while a portion of the coil remains in the microcatheter. Occasionally, endovascular retrieval is not possible and surgical removal may be needed to prevent parent vessel thrombosis or distal embolization. The technique described in this article represents an alternative, nonsurgical approach for recovering an irretrievable coil fragment involving stent stabilization against the wall of the ICA. Despite the presence of the coil fragments between the stent and the vessel wall in our patient, only mild intimal hyperplasia was seen at 6-month follow-up angiography. Further follow-up angiography is planned to see if this hyperplasia progresses. Recent advances in coronary stent technology have provided flexible stent delivery systems capable of reaching the intracranial circulation (5–12). These systems may revolutionize the management of ischemic and hemorrhagic cerebrovascular disease; however, several issues remain before widespread application of stent technology to the intracranial circulation can be advocated. These include intimal hyperplasia, thrombogenicity, perforating vessel patency, and stent flexibility. As experience is gained in the intracranial circulation with these devices, unique procedural complications and potential solutions are sure to occur. In our patient, a partially deployed AVE gfx stent could not be retrieved owing to its entanglement with a more proximal Wallstent. Stabilization by another stent against the vessel wall provided endovascular rescue and probably saved the patient from undergoing an open retrieval procedure. Only follow-up examinations will determine the effect of the pinned stent on both the native vessel wall and the stabilizing stent. The literature contains several articles addressing the issue of intracoronary stent malpositioning and retrieval (13–16). Foster-Smith et al (13) reported intracoronary stent malpositioning in four of 193 attempted stent placements. These were successfully retrieved by initially withdrawing the stent-balloon assembly out of the coronary artery, then using a nitinol gooseneck snare, a biliary forceps, or a multipurpose basket to remove the stent. All their cases involved initial difficulty in negotiating the lesion with the stent, making it necessary to reposition and manipulate the undeployed stent on its balloon catheter. Veldhuijzen et al (14) reported the retrieval of undeployed Wiktor and Palmaz-Schatz stents by using a technique involving two guidewires, in which the second guidewire was passed through the interstices of the stent and then twisted around the original guidewire. This maneuver fixed the wires to the stent and allowed it to be retrieved from the coronary circulation when it could not be withdrawn on its balloon catheter. Wong (15) also reported successful retrieval of two intracoronary stents by using a torqued dual guidewire technique. Elsner et al (16) described six instances of intracoronary misplacement of balloon-mounted stents in their experience involving placement of 518 stents in 419 patients. In four cases they were able to retrieve the stent from the coronary circulation successfully by using a 2-mm closed loop microsnare passed around the wire distal to the stent. This allowed withdrawal of the stent-snare-guidewire complex together through the groin sheath. Gupta et al (17) reported a case of stent malpositioning in the proximal right coronary artery (RCA) while trying to advance the stent distally through other stents to treat a distal dissection. Attempts at retrieval with a balloon and with the two-guidewire technique failed. The undeployed stent was then crushed against the wall of the RCA by deploying two additional balloon-expandable stents at the same site. This provided an excellent lumen and stabilized the undeployed stent against the vessel wall. Antiplatelet therapy was instituted, consisting of aspirin and ticlopidine, and a 4-month follow-up angiogram showed insignificant stenosis at the site of the crushed stent, with normal flow in the RCA. Pinning of a malpositioned stent against the vessel wall with another stent should be viewed as a last resort after attempts at either stent deployment or retrieval have failed. Our case demonstrates the feasibility of this maneuver with no significant immediate complications for the patient. In both the above cases, stents were able to provide endovascular rescue by stabilizing malpositioned, irretrievable intravascular devices. The best defense against the occurrence of such predicaments is prevention. In the first patient, heightened vigilance during advancement of a T-10 GDC through a T-18 catheter may have helped prevent the coil from unraveling. We now try to avoid passing T-10 coils through T-18 catheters when possible. When the use of both T-18 and T-10 coils in an aneurysm is anticipated, a Prowler 14 microcatheter (Cordis) can be used, which allows passage of both T-18 and T-10 coils with a smaller inner lumen (0.0165 inch, as compared with 0.021 inch). Theoretically, this could help minimize the chance of coil folding in the catheter. In the second patient, the presence of a more proximal Wallstent within the cervical ICA complicated attempts to retrieve an incompletely deployed intracranial stent. Perhaps if the first stent had been given some time to begin endothelialization, retrieval of the second stent through it may have been possible. In one study of coronary stents (18), neointima was present in all pathologic sections after 30 days. We now try to avoid placement of two tandem stents in one procedure when possible. If tandem stents are needed, we prefer to treat one lesion and allow time for endothelialization before treating the second lesion if the patient's clinical condition permits this approach. Our third case presented a fairly unique clinical situation, in which proximal sacrifice of the ECA was desired to control and prevent massive tumor-related hemorrhage that was believed to originate from a proximal ECA branch. Our idea for using a stent in this circumstance originated from reports describing treatment of aneurysms with a combination of stents and coils (5–7, 19), as well as from our previous experience in treating pseudoaneurysms of the carotid and vertebral arteries (20). Placing a Wallstent across the origin of the ECA allowed sacrifice at its origin, preventing potential coil embolization into the ICA. While this particular clinical circumstance is rare, other situations can be envisioned in which stents may prove useful in allowing occlusion of one vessel at a bifurcation while maintaining patency of the other, such as in the embolization of cavernous carotid feeders to arteriovenous fistulas, or in controlling external carotid hemorrhage in the face of traumatic head and neck vascular injury. Our three cases prove the versatility of intravascular stents, in two patients enabling the rescue of complicated procedures and in the third providing the solution to a complex clinical problem. Stents constitute a valuable tool in the arsenal of the neuroendovascular therapist. ↵1 Address reprint requests to G. Lee Pride, Jr, MD, University of Texas Southwestern Medical Center, 5323 Harry Hines Blvd, Dallas, TX 75235.